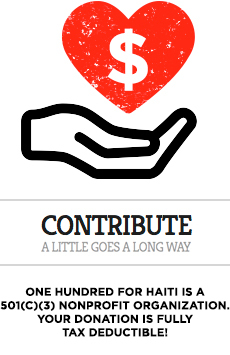 Q: How much of my donation will go towards helping people in Haiti? A: We operate differently than the big charities. We believe that you should decide where your money goes. And as a result, if you donate to One Hundred For Haiti, the money you donate goes directly to serve the people you hope it will. We have donors who offer funds for our overhead costs, and we appreciate that greatly, because it allows us to continue, and also ensures that your expenses for the website, fees for sending money, etc, don’t have to come out of our pockets. When we go broke personally from helping in Haiti, One Hundred For Haiti will end. But between now and then we are committed to having all of your donation go towards your intended and hoped for result. That said, if you’d like to help with our expenses along the way, we’d appreciate it greatly. Q: How do I know the money is going to what you say it is? A: Two ways: watching the videos we post after trips to Haiti that show the proof, and also, by taking our word for it. We create results,as proven by our track record over the last year since the quake. That said, we understand your skepticism. We live in a world of skepticism. There’s reason to question others. But after checking our videos and seeing the testimonials from the people we’ve served, you will be more assured in the results we create with your generosity. Q: Why don’t you work in the USA? There are problems here too you know. A: We know. 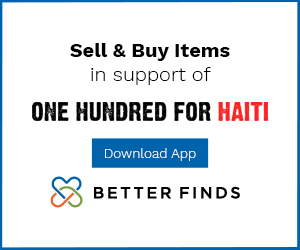 And since we’re already working in Haiti, we invite you to get involved with the domestic causes you believe in and start your own development/relief organization. We were called to work in Haiti by our passion for the people there. If you feel that your priority should be here in the States, then by all means spend the next year creating a network, an action plan, and an organization. That’s what we did. From scratch. And you can do it too. We’ll even advise you if you’d like support and ideas. That said, we believe that the word “community” and the word “neighbor” need to have their definitions expanded. When we restrict ourselves to those within eyesight as neighbors and when we consider only those in our immediate vicinity as our community, we restrict ourselves and exclude others. So to us, Haitians ARE us. They are neighbors, and part of our community as well, and as a result are in a direct line of response from us in terms of need demanding action. Q: What’s does “direct action humanitarian aid” mean? A: We coined the term, inspired by our friends who are involved with direct action campaigns around the world for various causes. They do not sit idly by and pay lip service to change. They take action. And that is what we do as well. The humanitarian aid portion speaks for itself. Combine them together and what you get is a group of people unwilling to sit idly by as people are in need, but instead who take action on their behalf, either in person or from afar. Q: What is the difference between “relief” and “development”? A: We started as a relief organization after the quake. We provided food, medicine, helped to facilitate survival and care of people. But then we realized that we wanted to be more than that. We wanted to be a development organization and to support transformation from within Haiti, not just handouts from outside of Haiti. Think of it as a hand up, rather than a had out. We aim to initiate and continue with projects that provide opportunities for Haitians to work, to create, to guide themselves…rather than to be dependent on others for their needs. Q: I only have $10 or $5 to donate. I am sorry I don’t have more! A: We’ll take it, and we’ll put it to great use in Haiti, AND, we’ll treat you like you gave us ten times as much. Many of our campaigns have been funded on small donations from countless numbers of people. While of course we always appreciate larger donations, we turn no one away who is interested in helping. Q: Can I get a tax-deductible receipt for my donation? A: We are a fully fledged 501c3 federal non-profit. As a result, yes we can offer an official receipt for your taxes. Check with your accountant for more information, and if you need an accountant who can advise you about this, let us know and we will connect you with ours. Email us anytime for a receipt for your donation! Q: Can I come to Haiti with you? A: We’re currently setting up expeditions to Haiti. Haiti is not for everyone. It is incredibly unstable in terms of its social structure, economy, political situation and more. Port au Prince is intense in its chaos at times. As a result, its not a place that is easy to travel to or through. We’d advise anyone interested in going to Haiti to consider seriously the idea, and if you are still devoted to it after doing research on your own, get in touch with us and we can discuss volunteer opportunities. We like to go to Haiti every few months, so if the time and project are right, there is a possibility of making something work. Q: What else can you tell me about your organization and your current plans? A: Well, you can download a detailed information letter here which spells out some our latest initiatives and thoughts about them: DOWNLOAD INFORMATION LETTER HERE.